Few people could deny watching whales in their natural habitat, anywhere in the world, is a special and emotional experience. Getting up close and personal with some of the world's largest animals is certainly awe-inspiring. 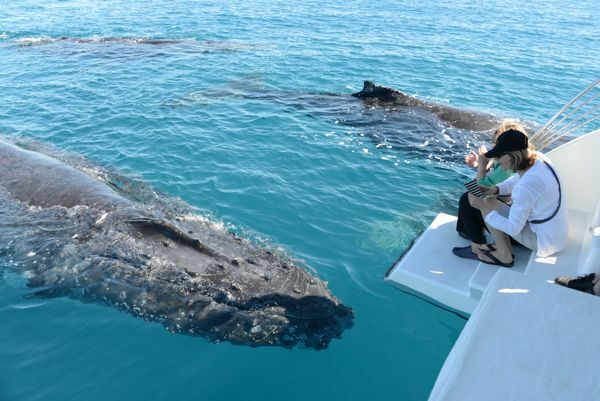 Whale watching in Hervey Bay, however, guarantees an unparalleled interactive encounter. Imagine a 40 tonne humpback whale sidling up to your boat, rolling over and looking you straight in the eye! Or being so close that you feel as though you could virtually reach out and touch them. This is the reality of a Hervey Bay whale experience and why the region holds the title of the 'whale watching capital of the world'. 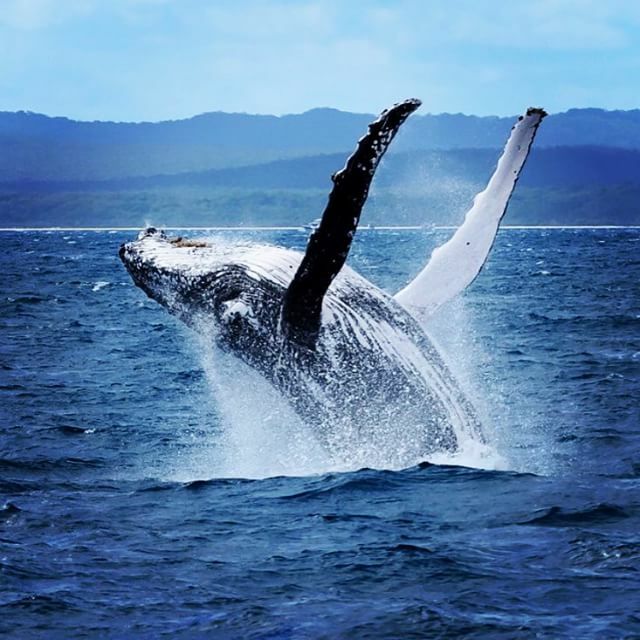 Between July and November annually, thousands of humpback whales travel the 'humpback highway' and arrive in the calm, protected waters of Hervey Bay – located within the Great Sandy Marine Park. Spending time in Hervey Bay allows them to rest, relax and socialise before continuing back to the Antarctic, where they spend the summer months feeding on krill and small fish before beginning their pilgrimage north again. Rest time is crucial for calves undertaking their first migratory trip, as well as for their mothers; who sacrifice their own energy to produce milk rich in fat. Calves aren't as strong, fast or coordinated as adults and this annual holiday provides them with an opportunity to rest, feed and build up their stores of fat, which are important for their survival in the sub-zero temperatures of the Antarctic. Protected by World Heritage-listed Fraser Island, the waters of Hervey Bay provide ideal conditions for the whales to take time out from their long and arduous journey. Consequently, it is here that the most amazing experiences can be had. Anecdotal evidence suggests that over the past few decades whale behaviour around boats within Hervey Bay has changed. During the early days of whale watching, whales would shy away from vessels. Females in particular were incredibly wary and would often place themselves between the vessel and their calf. Now the story is completely different. Whales will often approach vessels and stay close, interacting with the people on board for significant periods of time, a behaviour known as 'mugging'. Females are even pushing their calves towards excited whale watchers. Humpback whales are an exceptionally surface-active species. As a result, the diversity of behaviours they display during their stay in Hervey Bay is exciting, interesting and truly amazing. These behaviours are in stark contrast to when whales are in 'migration mode'. When travelling, whales rarely partake in the sport of people watching, which is so popular in Hervey Bay. During my time working in the whale watching industry in 2004/2005 I witnessed numerous close-up encounters with humpback whales. Two, in particular, stand out and are experiences I will never forget. The first was on a beautiful sunny, calm day with only about a dozen or so passengers on board. We came across a pod of three sub-adult males – they are like the teenagers of the humpback world - who soon decided we were worth a closer look and approached the vessel. Everyone stood together on one side to look at the whales, which were sitting in a tight group staring at us. Suddenly, they dived under the vessel and popped up on the other side so, naturally, we all moved over as well. After about a minute or so of watching us, the whales again dived under the boat to pop up on the other side. Again all aboard scurried over to see them. And so it went for about half an hour. The whales would swim under the boat, and everyone would hurry across to see them pop up on the other side. It was great fun, and if I were inclined to ascribe anthropomorphic values to the whales, then I would possibly say they looked like they were enjoying it too! The second experience was a similar day, only with a larger group of passengers. We found whales quickly and again they came over to us. They swam around the vessel a few times, giving everyone the opportunity to see them. One of our passengers was in a wheelchair and had positioned herself at the bow. She began to sing, quietly at first, but slowly got a little louder as she found her voice. When they got back to the bow the whales stopped and stayed in front of her, just watching. The lady stopped singing and the whales continued to swim around the boat, but when she started again they were straight back in front of her. It didn't take everyone long to figure out something special was happening, and other passengers soon crowded around her and encouraged her to keep singing. While she sang the whales did not move, they just stayed in front of her, listening. To be honest, I have no idea what she sang. Actually, I'm not sure I ever knew. But one thing I do know is that it was one of the most incredible things I have ever seen. As for the other passengers? From the discussions I had with some of them at the time it would seem they felt the same. Jacinta Padgett has over 15 years' experience working in the tourism, environmental and natural resources sectors, including the whale watching industry. She has held positions as a marine mammal trainer, interpretive ranger, marine biologist and conservation officer. She has qualifications in Environmental Science and a passion for environmental education, believing that engaging with the natural world is the key to understanding conservation. 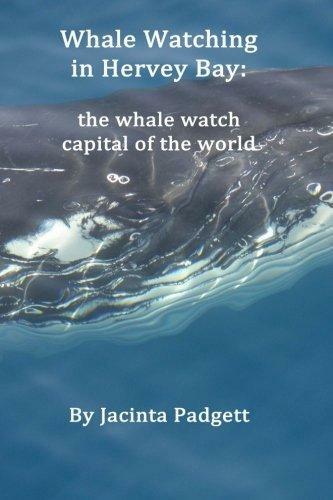 After discovering a love of writing, and completing Freelance Journalism studies, Jacinta has released two children's books (in a series of five) designed to instill a sense of wonder and enjoyment of the natural world in younger readers.